Of the six quartets in Op. 18, Ludwig van Beethoven (1770-1827) composed the G Major Quartet first chronologically. However, he then spent much time revising it. In musical sketchbooks from 1798-99, Beethoven extensively and laboriously worked out four of the quartets. The earliest is the D Major, making it his first completed mature string quartet. As in his Symphony No. 1 (from the same general period), Beethoven introduces musical uncertainty right from the first notes, and that sets the tone for the entire first movement. In the graceful first theme group, instead of comfortably establishing the home key, the composer gives us a plethora of notes ornamental to the underlying harmony. Classically, the second theme group should be in the key of A major, but Beethoven takes us to the “wrong” key of C major for the first part, then jerks us into A major with two or three assertive chords. In the development section, he goes even further by clothing much of his thematic material in unaccustomed minor keys. What might be an otherwise routine recapitulation is spiced considerably by splashes of the minor mode and remote keys, notably E-flat (!) only moments before the movement’s ending. Maintaining character, Beethoven leaps into the key of B-flat major for the Andante movement. The music begins in a serene mood, then runs a gamut of emotions that show Beethoven writing from the heart (rather than by form) with remarkable maturity. Against the music’s pulsating continuity, the individual instruments often take on special characteristics, becoming almost like players in a drama. Again foreshadowing the First Symphony, the Allegro third movement is a true Beethoven scherzo — essentially a minuet at breakneck speed. The high spirits in the outer sections contrast with the Trio, where the violins conduct a whirlwind dialog in the minor mode. In the finale, Beethoven whips up the scherzo’s joviality into a frothy lather of triplet notes and jabbing accents. As in the first movement, the underlying harmonies run far afield at times. Despite this Presto’s near-perpetual motion, a few definite themes emerge, notably an idea that reminded one annotator of the “Mexican Hat Dance.” However, Beethoven — always full of surprises — ends this otherwise boisterous and bombastic movement with the quietest of low whispers.
. . . This is first and foremost a problematic work which thrusts in the direction of eccentricity and self-absorption. But Beethoven at his most quirky is Beethoven possessed. In this quartet, and in none of the others so far, he evokes that almost tangible sense of the artist assaulting a daemon of his own fancying. . . . The F-minor Quartet is not a pretty piece, but it is terribly strong — and perhaps rather terrible. . . . The piece stands aloof, preoccupied with its radical private war on every fiber of rhetoric and feeling that Beethoven knew or could invent. Everything unessential falls victim, leaving a residue of extreme concentration, in dangerously high tension. 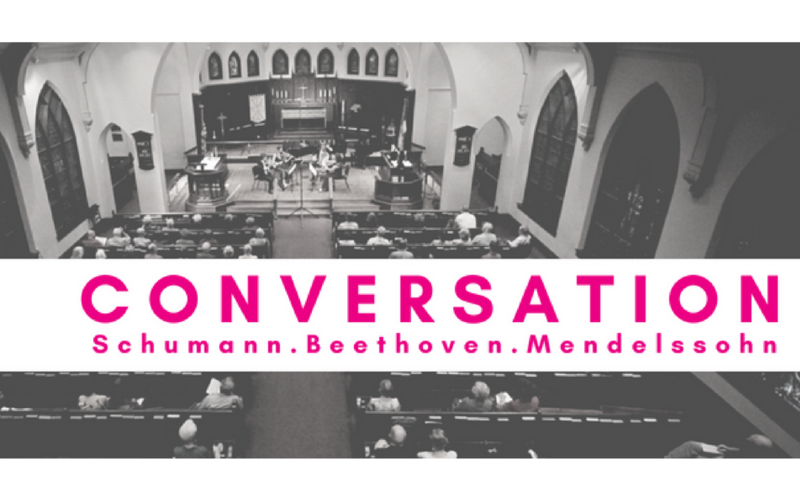 Kerman uses the word “concentration,” and we might paraphrase that with the word “compression.” For the individual movements of this quartet are among the shortest Beethoven ever wrote in this medium. And just as air heats up when compressed, so does Beethoven’s music. The first movement, for example is dominated by the opening five-note motive. Though he does introduce other ideas, this brusque idea recurs often, virtually etching itself on our ears. The form of the movement, too, is compressed. Ignoring the usually obligatory repeat of the exposition, Beethoven plunges into a compressed development after just one hearing. Then, the recapitulation is a compressed version of the already terse exposition. Finally, the coda concentrates on the five-note motive, gradually grinding it down dynamically from a pounding fortissimo to a whispering pianissimo. Beethoven named this quartet “Serioso” himself, and nowhere in it is the description more apt than the second movement. With melancholy concentration, the composer introduces a fully harmonic opening paragraph. We find no prettiness here, nor in the middle section, which starts as a fugato on a new idea. This dissolves into a wispy episode. Then another fugue begins on a new theme, but now the first fugato theme joins in: a double fugue! (The careful listener will also hear the original theme occasionally turned upside down.) After a reprise of the opening paragraph, the music becomes quiet, only to be shaken by the forcible opening of the third movement. The movement would be the “scherzo” (scherzo = joke), but this music is no laughing matter. In Beethoven, anger and determination are often indistinguishable, and this is one of those times. The recurring Trio section offers some emotional relief, but the persistent main idea always hammers away afterward. The brief Larghetto introduction to the finale bespeaks tragic introspection, but it leads to music that comes off like a quick waltz. This not a merry waltz, however, but a passionate and driving one, much like the breathless finale to the “Appasionata” piano sonata (also in F minor, incidentally). By contrast, the major mode coda at the very end could be taken as some kind of joke on Beethoven’s part. Having been dubbed a “comic-opera” ending, it is almost as if Beethoven thought, “Whoops, we’d better give them a happy ending.” Whether we take the music this way or, more nobly, as proof of the composer’s belief in an indomitable human spirit, we come out with positive feelings. The string quartets and Grosse fuge of Opp. 127-135 were the last music penned by Beethoven, and if the early and middle works of Beethoven were often misunderstood in their day, the final ones were a complete enigma. The unusual qualities of these works were so alien to early audiences that many listeners ridiculously considered the quartets to be either the absent-minded doodling of a once-great master in his dotage or the work of a man so totally deaf and out of touch with musical sound, that he could no longer distinguish consonance from dissonance — even on paper! The truth of the matter is that the last quartets are transcendental. They transcend the standards of form, harmony, and chamber technique as they were known at that time. A mystical quality also pervades the quartets, which Aldous Huxley used symbolically in his novel, Point Counter Point. Then there is the matter of technical difficulty. 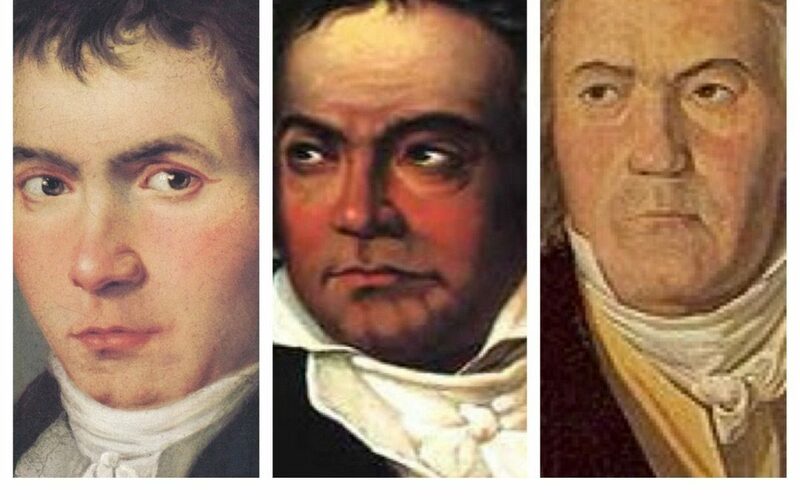 Never a composer to compromise, Beethoven’s grand visions infused his last quartets with a multitude of transcendental difficulties in rhythm, ensemble playing, and pure endurance. The material and extremely plastic structure of the opening movement certainly support that idea. Introductory material recurs during the movement, and there is a free flow between themes and chief sections. Following an unusual harmonic opening, the slow movement proves to be the extended lyrical centerpiece of the entire quartet. Here is a set of six variations on a long-lined theme, luxuriant in harmony yet vibrant in its rhythms and variety of ideas. The Scherzo is similarly a full-length essay, but one dominated by the puckish, four-note motive announced in the cello at its beginning. The Presto Trio section literally skims along, and Beethoven brings back a taste of it as part of the coda. The finale recalls much of the singing Allegro quality of the first movement and its structure is every bit as compact. A lucid modification of rondo form, the movement finally melts into the sweep of triplets that drive the final coda to a brilliant close. In the art songs of Robert Schumann (1810-1856), the composer makes the piano a more equal partner with the voice than any song composer had done before. We might even say that for Schumann, songs were an extension of his piano music, which, up to 1840 (the “song year”), was the only type of music he had composed. So it is with Schumann’s chamber music. Except the string quartets, every one of his chamber works employs the piano. In this music, the piano is at least an equal partner and often the predominant one. Good examples are the four chamber works he composed in 1849 as experiments for a solo instrument coupled with the piano: the Adagio and Allegro for horn (Op. 70), the Fantasiestücke for Clarinet (Op. 73), the Romanzen for oboe (Op. 94), and the Fünf Stücke im Volkston for cello (Op. 102). The Five Pieces in Folk Style are miniatures containing the simplicity, bold expression, and broad humor of German folk songs and dances. The first, Mit Humor, is a jaunty piece dominated by anapest rhythms and a whimsical mood. In contrast, Langsam (slowly) is like a lullaby or meditative ballad focusing largely on the cello’s melody. The third piece, marked Nicht schnell (not fast), begins and ends as a little wistful waltz; then, surprisingly, the meter and mood change to become assertive and declarative. Nicht zu rasch (not too quickly), is one of Schumann’s passionate moments often associated with his manic side. In his writings and in the Davidsbundertänze for piano, he ascribed this mood to a character named “Florestan.” The final piece, marked Stark und markiert (strong and well-marked), is characterized by triplet rhythms — more dance than song. Again showing Florestan (now in an impetuous mood), this concluding music moves to strong chord progressions, both cello and piano asserting their individual but cooperative messages. After having looked through these strange sonatas, overladen with difficulties . . . [I] felt . . . exhausted and without having had any pleasure. . . . Bizarre . . . Learned, learned and always learned — and nothing natural, no song . . . a striving for strange modulations. . . . If Herr v. B. wished to deny himself a bit more and follow the course of nature he might, with his talent and industry, do a great deal for an instrument [the piano] which he seems to have so wonderfully under his control. Such bad press obviously did not deter Ludwig van Beethoven (1770-1827) from his vision. In all, he composed ten violin sonatas spread over his first and second style-periods, including the famous “Kreutzer” Sonata (Op. 47). The last violin sonata was composed in 1812 and published as Op. 96. From the beginning of the D major Sonata, the violin and piano are on an equal footing, departing from the 18th-century convention of a predominant piano part. The main theme group is involved, but the second becomes a dialogue between the instruments. Suddenly, we are in a new key for the opening of the development section, which searches through successive modulations, finally finding the home key for the recapitulation. In the concluding pages of the movement, Beethoven again goes exploring harmonically before returning to D major to finish. The second movement is a set of four variations on a delightful Andante theme shared by the violin and piano. In the first variation, the piano’s right hand seems to improvise new melodic twists to the theme. It is the violin’s turn to do this in the second variation. In the third (minore)variation, violin and piano seem locked in a competitive struggle amid sharp dynamic contrasts. The final variation presents a hymn-like melody, forecasting one of Beethoven’s most profound and effective gestures. The movement’s ending is more a postscript than a coda. Beethoven begins his rondo finale in textbook form. Then, suddenly the violin turns to the minor mode, leading to a restless middle section. With a reprise in the major, again come several harmonic novelties and an unusually abrupt ending. ​“He has raised himself so high that we can indeed say he is the Mozart of the nineteenth century.” Those words were Robert Schumann’s reaction to the music of Felix Mendelssohn (1809-1847), and particularly his feelings about Mendelssohn’s first piano trio (in D minor, Op. 49) written in 1839. Schumann’s readers must have agreed, for that work became one of Mendelssohn’s most famous. Six years later, he again turned his hand to the piano trio medium, this time producing the C minor Trio, Op. 66. It was composed in the same year as his famous Violin Concerto in E Minor and, thus, is one of Mendelssohn’s most mature works. The composer dedicated the trio to Louis Spohr, and they were known to have played it together. ​Although the C minor trio has not received the unqualified raves enjoyed by the earlier work, it shows Mendelssohn’s growth during the intervening years. The first movement, with its very flexible thematic material, is a peak in Mendelssohn’s rise to technical perfection. Here, he treats his themes more contrapuntally than usual. After a routine slow movement, the composer unfolds a sparkling Scherzo reminiscent of the elfin Scherzos in the String Octet and A Midsummer’s Night’s Dream. ​We are most used to hearing such music by Sergei Prokofiev (1891-1953) as Romeo and Juliet, the Lt. Kije Suite, The Fifth Symphony, or the later piano sonatas. Those works were products of the repatriated Prokofiev who sought to reach a wide audience and satisfy Soviet authorities. However, there was an earlier Prokofiev, the expatriate with a home base in Paris. This was the Prokofiev of The Fiery Angel, the Second to Fourth Symphonies, and works that show the “primitive” fallout from the earlier Scithian Suite, Sarcasms, etc. The composer resided outside the USSR nearly 20 years, during which time his music was often a little rebellious, a little tinged with French neo-Classicism, and a bit influenced by his fellow expatriate, Igor Stravinsky. ​The impetus for composing the First Quartet came during a tour of the United States in 1930. Here, the Elizabeth Sprague Coolidge Foundation of the Library of Congress commissioned him to write, specifically, a string quartet. As a composer, Prokofiev was not attracted naturally to chamber music, his output being a mere handful of works. However, he accepted with good grace and produced his First Quartet with diligence. In April 1931, the Brosa Quartet gave the premiere at the Library of Congress. ​In preparation, he even made a study of Beethoven’s quartets. “That is the source of the rather ‘classical’ language of the quartet’s first section,” Prokofiev later said. Actually, that section — with its squarish-sardonic theme and propulsive accompaniment — is more typically Prokofiev than what follows. The torso of this loose sonata-form is reminiscent of late Beethoven quartets: heavily contrapuntal, broadly developmental of a few short themes, and deadly serious. Here is the intellectual side of Prokofiev we rarely hear. At the opening of the second movement, Prokofiev tricks us into thinking it will all be slow. However, after a few moments it turns out to be the quartet’s “scherzo,” a big, A-B-A structure, somewhat polyphonic like the first movement. The “A” section’s scurrying quality is a foil for its catchy violin theme. Imperceptibly, the rhythm turns to triplet motion for the B (Trio) section. Here, the music is more ingratiating and traditional. The breathless A section returns to bring closure. ​The Andante promised in the foregoing movement is delivered fully in the finale. Here is the most emotionally intense portion of the quartet, where Prokofiev is at last completely at home in his contrapuntal language. This comes across most clearly in the frequent dialogues between high and low instruments. A movingly rich harmonic palette also pervades the movement. Soviet critics later deemed the Andante to be “a peculiarly Russian Romantic introspection,” interpreted as the composer’s longing to return to his homeland. Quite possibly that was the case, for in a few short years, Prokofiev did repatriate to Russia. In addition to his remarkable prowess as a composer, Béla Bartók (1881-1945) was a professional-level pianist. He performed the premieres of his First and Second Piano Concertos as well as many of his solo works. During the 1920s, Bartók developed a special interest in composing solo music for his instrument, the high points being his only Sonata for piano (1926) and the suite, Out of Doors, also completed in 1926. The composer performed the premieres of both works the same year. Although Bartók did not reveal the impetus for composing his suite, some part of it apparently was related to his current editing of 17th – and 18th-century keyboard music, particularly the suites of Francois Couperin. Although Bartók titled his suite’s third movement “Musettes,” we hear no Baroque posturing such as might be present in Stravinsky’s music from the same period. Yet the Out of Doors suite is not even neo-Baroque. Its five varied movement titles — “With Pipes and Drums,” “Barcarolla,” “Musettes,” “The Night’s Music,” and “The Chase” — may strike the listener as more akin to those in Robert Schumann’s loosely constructed piano sets. “With Pipes and Drums” takes full advantage of the piano’s percussive possibilities, which Bartók had perfected about ten years earlier in pieces like Allegro barbaro. Hammer-like dissonances and tone clusters support a fragmentary melody. “Barcarolla” rests atop undulating accompanying figures, which are rhythmically asymmetrical. The smooth melodies we might expect of traditional barcaroles are here replaced by somewhat jagged, un-romantic strains, where we might suspect some underlying psychological commentary. In “Musettes” we hear only occasional melody. The focus is on the low drone sounds of small bagpipes (18th-century musettes) and mid-range figuration. The pounding drones dominate and drown out melodic suggestions. “The Chase” is the suite’s final movement. It amplifies the mood of the first movement to a frenetic level. Atop a rapid, dissonant, repeated figure (ostinato) rides the main focus of the music — not really a melody, but “chase music” such as we might expect in a Western movie. Bartók makes his suite’s finale brief but of high impact. The techniques here employed to create the atmosphere of the out-of-doors at night include the blurred sounds of pianissimo cluster-chords, each introduced with a gruppetto of three notes, as a background, against which are heard the twitterings, chirpings, and croakings of nocturnal creatures. Presently a folklike tune is heard in a single line, doubled three octaves above; still later a flute melody . . . appears, upon which cluster-chords, played with the palm of the hand, impinge; then the two tunes are superimposed, as if heard simultaneously from different directions. Fragments of the flute melody continue to the end, evanescent as the night sounds. In this astonishingly convincing nocturnal excursion Bartók succeeded, as in the many which followed, in devising a music of an intensely personal character which nevertheless re-creates for the listener an atmosphere incapable of misinterpretation. Futurism is not even a name to me. If my music becomes more generally understood at some future time, perhaps, from that point of view it might be called futuristic music. All that I am attempting to do is to express myself as honestly and convincingly as I can in the present. In 1922, Ornstein abruptly retired for the most part from the performing stage, continuing to build his career as a composer. He did, however, establish The Ornstein School of Music in Philadelphia, where he remained director until 1953. Much of his music was and is little known, yet he received the Marjorie Peabody Waite Award from the National Institute of Arts and Letters in 1975. He continued to compose into his 90s, when he wrote some of his finest music. Ornstein’s Piano Quintet comes from the year 1927. The first movement displays a blend of experimental modern (futurist?) tendencies and more traditional leanings, especially in melody. Some melodies and rhythms suggest Russian, Jewish, or Middle Eastern influences, which might hark back to Ornstein’s pre-American childhood, while other tunes are downright post-Romantic. One striking feature of his forms is a tendency to develop an idea or texture for a short while, then to move on to something new. Perhaps this harks back to Debussy’s do-next-thing procedures in form. The first extended section of the second movement seems to be an Eastern or Middle-Eastern style dirge employing compelling string effects. Variants on these ideas follow in the strings and the piano. A heroic march breaks in and runs its course. Long lyrical lines for the strings and then the piano follow. This is a free reprise of the first extended section, and it quietly brings the movement to a close. The final movement brings back the contrast of lyrical and pounding ideas heard in the first movement. Now, however, the music takes on more determination and forward force. The central section, however, is compellingly long-lined and sweet. A passionate rhapsodic mood then sets in, and earlier ideas are developed. Finally, the main theme is stretched out into a long, reflective statement that becomes the Quintet’s final coda. Capriccio by Jacques Murgier (1912-1986) is the work of a violinist and former director of the Conservatoire Nationale. The piece’s main theme is in the “capricious” sounding 5/8 meter. It is actual a series of variants on a central musical idea. The piece’s central section is smoother and more dreamy. Pavane by José Berghmans (1921-1992) is actually more of a comic cakewalk than a classic pavane. Its composer was also a musicologist, so the Pavane’s title and quirky dance rhythms must be tongue-in-cheek. Serenade by Robert Planel (1908-1994) contains strong elements of Spanish Gypsy Flamenco dance. The outer sections of the piece give us the feeling of rhythmic heel-work, while the lyrical middle is reminiscent of a copla, or sung verse. Planel had a distinguished career that he began by winning the coveted Prix de Rome. Romance by Henri Barraud (1900-1997) is the most dissonant piece of this set. Smoothly lyrical and controlled, however, the music makes pleasurable sense. In his career, Barraud organized performances of contemporary music and was music director of the French Radiodiffusion for over 20 years. Philippe Gaubert (1879-1941) was one of the most versatile French musicians of the early 20th century. After winning the Paris Conservatoire’s premiere prix in flute and second place in the Prix de Rome (composition), he went on to perform with the Paris Opéra and the Société des Concerts du Conservatoire, eventually becoming principal conductor to both. All this he did while teaching the flute at the Conservatoire and forging an active career as a prolific composer and arranger. Gaubert’s writing style has been described as “somewhere between Fauré and Dukas — colorful in harmonic language, with elegant melodic lines and brilliant, rhapsodic passagework” (The New Grove Dictionary). The Two Pieces fit this description very well, and idiomatic flexibility could be added. Besides the original publication for the oboe, the pieces have been adapted to the flute and to the clarinet. No. 1, “Romance,” begins with a long cantilena, mostly in the oboe, against a waltz-like piano accompaniment. The contrasting section that follows departs from the waltz feeling and turns more overtly emotional. The music becomes more subdued for a quiet ending. No. 2, “Allegretto,” is much briefer but more virtuosic for the oboist. “Arabesque” comes to mind when describing the oboe’s fanciful melodic lines. This second piece provides pleasant relaxation following the more intense previous composition. We are used to thinking of Carl Nielsen (1865-1931) as a symphonist only. However, especially in his early years, he contributed seriously to the chamber medium. Nielsen completed five string quartets, a string quintet, a woodwind quintet, three violin sonatas, and some shorter works. In 1889, Nielsen became a second violinist in the Royal Danish Orchestra. The steady income enabled him to compose. About two years later he wrote his Two Fantasy Pieces for solo woodwind and piano. Nielsen’s first conception was for the clarinet. However, the music is flexible enough and sufficiently modest in range to adapt well to the oboe. The Romance is astonishing for so young a composer. The engaging melodies and then-modern harmonies make for a memorable listening experience. The piece’s central section differs subtly from the reprised first section, and Nielsen even cleverly inserts some counterpoint, which actually has an emotional impact. In the character of a strutting folk dance, the Humoresque raises the listener’s spirits. As in Brahms’s folk-inspired dances, Nielsen knows to occasionally relieve the bright rhythms with some smooth lyricism. It all works to provide the listener with a buoyant miniature. Altogether, the youthful Two Fantasy Pieces give us a brief yet brilliant foretaste of the masterful music still to come from the mature pen of Carl Nielsen. Born in Odessa, Russia in 1962, Yuri Povolotsky completed his education in 1986 at the Gnesin Russian Music Academy in Moscow. His chief teachers were Heinrich Litinsky and Alexei Muravlev. About five years later, Povolotsky moved to Israel, where he has made a successful career as both a composer and keyboardist. Povolotsky’s symphonic and chamber works in several styles and genres have been performed in Israel, countries of the former USSR and in more than two dozen other countries around the world. Several of those performances have been part of festivals. His concert works have earned him two prestigious Israeli awards: the Jerusalem Olive (2007) and the Yuri Stern (2009). Povolotsky is also active as a composer-performer of “Jewish Soul Music,” that is, Klezmer. He is artistic director of the Jazz-Klezmer band APROPOS.ART, in which he plays keyboards. The Oboe Sonata was written in 2010. Its first movement captures Poulenc’s spirit beautifully: alternations and combinations of lyricism and playfulness. The music flirts with neo-classicism; nonetheless, the composer’s personality shines through. The Misterioso second movement begins rather like an action film, only to be momentarily interrupted by a feeling of film noir mystery. Then, the chase continues. In Con elegia, a long plaintive melody by the oboe is answered at intervals by the piano. Emotional tension increases until an oboe cadenza brings back the tenderness of the opening. In the finale, we hear a bouncy, often humorous dance with a punchy piano part, but the oboe has one passage of refined lyricism (a last reflection of Poulenc?) before a drive to the bubbly finish. The title and the subtitle of the piece reflect its structure, which, however, serves only as the background for the development of the author’s original ideas. Even the composition’s form is not traditionally comprised of three parts, but of a complete four-part cycle, in which the neoclassical aura successfully coexists with modern rhythms and sounds. The world premiere of the sonata took place on January 30, 2013 in Moscow, on the occasion of the 50th anniversary of the death of Francis Poulenc. The Great Depression of the 1930s was an extremely difficult time for Americans. However, one positive aspect of this period was a heightened sense of patriotism. In music, this was expressed in the birth of American Nationalism, in which composers used or adapted American folk music. Two famous examples are Aaron Copland’s Billy the Kid ballet (1938) and Roy Harris’s Folk Song Symphony (1939). Some composers absorbed elements of folk style to the extent that their original melodies seemed like actual folk material. That was the case with Wayne Barlow (1912-1996) when he wrote The Winter’s Passed for oboe and strings. This piece is based on a single original theme, but a theme that contains strong echoes of Appalachian hymns and songs. The opening makes an expressive exposition of the theme — first by the piano, then by the oboe, and finally both instruments in counterpoint. A faster section develops the melody. Then, the plaintive slow tempo returns, reprising the theme in the oboe, then the piano. A modest coda joins the oboe again with the piano for a soft, reflective ending. Composer Wayne Barlow, together with Howard Hanson and others, helped to put the Eastman School of Music on the map. Educated at Eastman, Barlow taught composition there 1937-1978, eventually chairing the composition department and becoming Graduate Dean. Interestingly, along the way, Barlow’s musical interests shifted toward serial and electronic music — a far cry from The Winter’s Passed. The year 1938 was a focal one for Paul Hindemith (1895-1963). It was the year in which his great opera, Mathis der Maler, was premiered. This masterwork represented a new cosmopolitan direction for his musical style. Hindemith was searching for a music syntax and tonal organization that might be a worthy successor to the major-minor system of previous eras. Gradually during the 1930s, Hindemith had evolved his new style, and in 1938 he was in the midst of writing The Craft of Musical Composition, a multi-volume theoretical work that detailed his new discoveries. The year 1938 was also the time when Hindemith composed his Oboe Sonata. In the course of his career, Hindemith wrote solo sonatas for every instrument in the orchestra, the majority of these works coming from the period 1937-1949. The Oboe Sonata was, therefore, one of the earliest composed and published in the series. Rhythmic interplay characterize the opening section of the first movement. While the oboe exposes the first theme in 2/4 time, the piano accompaniment continually shifts its metrical accents, giving the impression of 3/8 time. In the transition to the middle section, the meter changes freely and the piano part takes on more significance. A smoother, less rhythmic middle section leads back to an abbreviated reprise of the opening section. The second (and final) movement alternates between slow and fast sections. The somewhat baroque-style slow opening introduces a lively gigue-like section. A variant of the slow section returns, leading to the final section. This time Hindemith transforms the gigue into a quick concluding fugue, beginning in the piano but soon taken up by the oboe. As the end approaches, the piano recedes into the background leaving the spotlight on the oboe. To international audiences and musicians outside France, Eugène Bozza (1905-1991) is known for a remarkable number of chamber works for woodwind and brass instruments. However, in his native land, he also had a long and successful career as a conductor at the Paris Opéra-Comique and as director of the Ecole Nationale de Musique. His awards and honors included the Légion d’Honneur, in which he was made a Chevalier in 1956. The opening Lent might have also been designated misterioso or exotico. The piano having laid down a rumbling introduction, the oboe plays melodies, runs, and flashy ornaments in exotic scales. This extensive middle section finally melts into dreamy impressionism before the movement ends with a reprise of the very beginning. A true valse triste or gymnopédie, the moderato central movement gives the oboe extensive opportunities for lyrical expression against unusual harmonies in the piano part. The finale is jolly and scherzando. Bozza gives us some rarely heard oboe figuration and turns of phrase that might re-define the traditional character of the instrument. As in the previous movements, oboe and piano are here tightly connected musically, giving us a clearly drawn 20th-century French composition. When, in 1796, Joseph Haydn (1732-1809) was composing the six string quartets of Opus 76, Mozart had been dead more than five years, and Beethoven was working on such music as he three piano sonatas of Op. 10. Two years later, Vienna would see the publication of both Haydn’s quartets and Beethoven’s Grand Sonata Pathétique, Op. 13. While progressive musical tastes were moving to newer ground, an honored place was still reserved for the master classicist, the “father” of the string quartet. The Opus 76 set contains two of Haydn’s most famous quartets: the “Quinten” (No. 2) and the “Emperor” (No. 3). Number 1 in G major was not composed first of the six, and it displays a curious combination of older style and the newer, quasi-Beethoven tendencies.The opening Allegro’s main theme is exposed in the cello without accompaniment at first, as if it will become the theme of a fugue. This is indeed picked up by the viola and a pseudo-canon follows. Like the spirit of the theme itself, this is one of Haydn’s jokes, and one he refrains from reiterating in the recapitulation. A few other Baroque-isms occur in this movement, notably some sequenced groups of chords. From the second movement on, a more progressive, possibly even Beethoven-influenced, mood occupies much of the music. The Adagio features a hymn-like theme, which, like Beethoven’s “Pathétique” Adagio, partakes of the French post-revolutionary taste for slow, noble hymns. The Menuetto (Presto) is actually Haydn’s first real “Scherzo” in the speed and spirit of Beethoven (although Beethoven borrowed the term from Haydn and other earlier composers). The sudden fortissimo during piano passages likewise betray Haydn’s knowledge of the works of his former student. The Menuetto’s trio section is like a rustic dance with its sharply defined rhythms and phrasing. 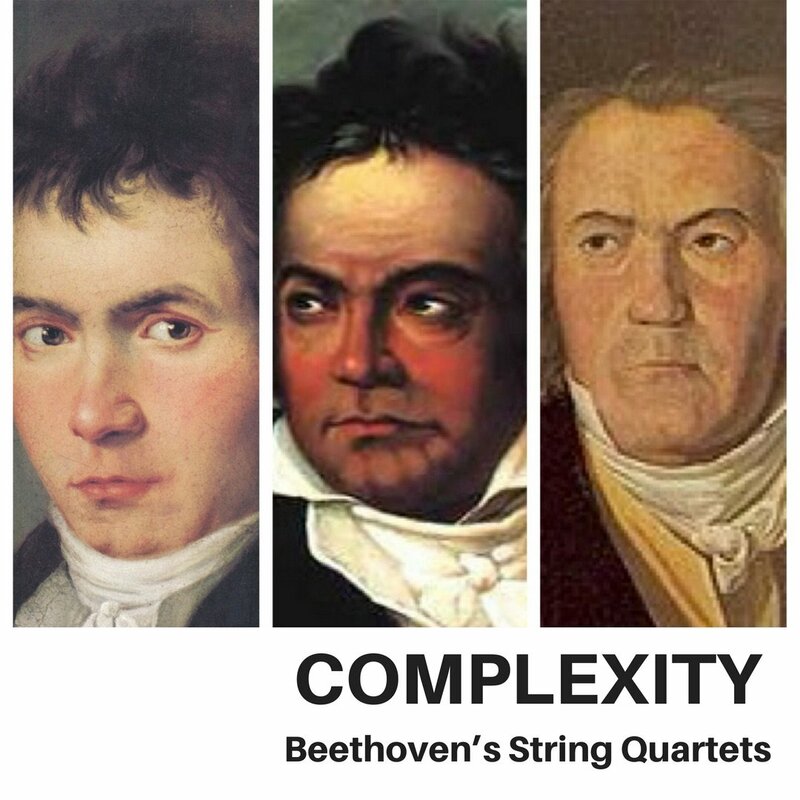 The three string quartets that comprise Opus 59 by Ludwig van Beethoven (1770-1827) are collectively nicknamed the “Razumovsky” Quartets. They were commissioned by Count Andrey Razumovsky, Russian ambassador in Vienna, who was an amateur quartet player himself. The count stipulated that the quartets contain some Russian folk music. Only the first two quartets contain actual quotations of Russian folk tunes. However, the third in C major presents only a somewhat brooding slow movement as a reminder of Russian moodiness. The F Major Quartet begins unceremoniously with an unusually lyrical theme heard first in the cello. This theme will come to dominate the first movement. The second thematic group is a bit unclear, but a series of pointillist chord sonorities in high and low registers forms an important punctuation. The exposition does not repeat, although the long, symphonic-proportioned development begins as if it were such a repetition. A fugal episode is central to this energetic, harmonically adventurous section. An unexpected appearance of the main theme introduces the recapitulation. The reaffirmation of this theme is also the foundation of the coda. First, it is heard fortissimo with block chords supporting; then, each instrument, in turn, plays its ascending first idea. The innovative second movement is a scherzando that breaks with the traditional Scherzo/Trio/Scherzo scheme. It is a blend of scherzo and sonata form with three main sections and a development. Beginning with the simplest one-part texture, rhythm will clearly be the music’s governing element. Yet as the movement unfolds amid multiple, shifting moods, humor becomes the governing emotion. Examples are the fortissimo outbursts followed immediately by threadbare, pointillist passages reminiscent of the previous movement. The Adagio has a profoundly tragic bearing. This is partly due to its minor key, but even more attributable to its “program.” In the margin of the sketch, Beethoven scratched “A weeping willow or an acacia over my brother’s grave.” This referred to an imaginary dead brother in a fictional scenario. Both the sorrowful character and the symphonic proportions of this movement hark back to the Eroica Symphony. The Allegro finale is connected to the slow movement by a trill in the First Violin. Subtitled Thème russe, this good-natured movement’s main melody is an adaptation of the Russian song, “Ah! My Luck, Such Luck.” As in the opening movement, the cello introduces the leading theme. In contrast to this bumptious tune comes a smooth second theme of scale figures to round out the short, repeated exposition. The development and recapitulation put the Russian theme through its paces in assorted harmonic guises and contrapuntal manipulations. At the end, an Adagio parody of the theme leads to a brief Presto coda. There is the young boy, separated from his mother and held almost captive by a possessive grandmother, who won’t let him go out to play but wants him always at her side. There is the writer, returning to his desk every day at midnight to write his books and plays in monkish isolation. There is the public man, uniformed, advocating the Bushido Code, acting the role of military commander of his own army. On the last day of his life, he is ceremoniously dressed by a follower and adheres to a rigid timetable that leads to his meticulously planned and rehearsed suicide, or seppuku. Considering that he is a man fully committed to plunging a sword into his own guts, he seems remarkably serene; his life, his work, his obsession have finally become synchronous. The film interwove flashback scenes from Mishima’s life, his last day of life, and dramatizations based on his writings. The astonishing musical score by Philip Glass utilizes a full orchestra, a string orchestra with percussion, and a string quartet. The quartet portions accompany the six black-and-white flashbacks and are some of the most effective segments of the whole score. Glass has remarked, “At the time of writing the film music, I anticipated the String Quartet sections would be extracted from the film score and made into a concert piece in its own right.” And the present work is the result. A Note on the Composer: Music with popular touches is the hallmark of Philip Glass (1937- ). Appealing equally to fans of rock, jazz, and classical music, Glass is the ultimate “crossover” composer. This has been the case since 1965, when he developed a new musical vision while working on a film score with sitar player Ravi Shankar. Glass’s style became associated with a new trend in American music called “Minimalism.” (Glass despises the term, but then most composers resent being pigeonholed.) Minimalist music focuses on simple short melodies, which are repeated and varied over a space of time. This type of classical music is somewhat akin to popular “New Age” music. Notes by Dr. Michael Fink. Copyright 2018. All rights reserved.